Papa Roach share video for their new single Elevate - track taken from their latest album Who Do You Trust? Papa Roach have released a video for their new single Elevate. The track has been taken from the band’s latest album Who Do You Trust?, which launched in January this year via Elven Seven Music. Check out the Caleb Mallery-directed promo below. Who Do You Trust? followed hot on the heels of the band’s 2017 album Crooked Teeth, with frontman Jacoby Shaddix previously explaining to Rock Sound: "We were supposed to go on tour with Of Mice And Men at the beginning of the Crooked Teeth cycle – and former vocalist Austin Carlile got really sick, so the tour was cancelled. “We were, like, ‘If we're not going to be out on the road, let's go create.' So we went in and created five or six songs. Then we went back in June and July and took another stab at it. We have 12 songs – there's bangers in there." 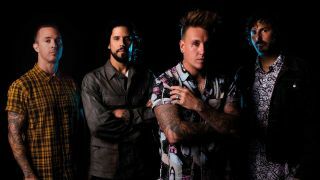 Papa Roach are gearing up for their UK tour, which will get under way in Southampton on April 13.